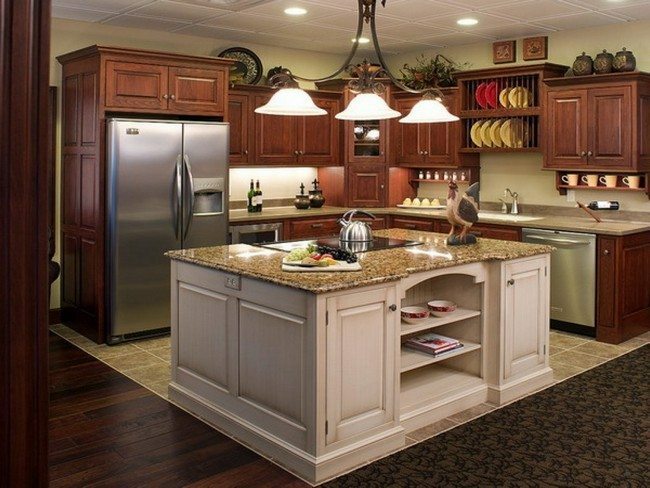 Who said kitchen cabinets have to be made from one material? 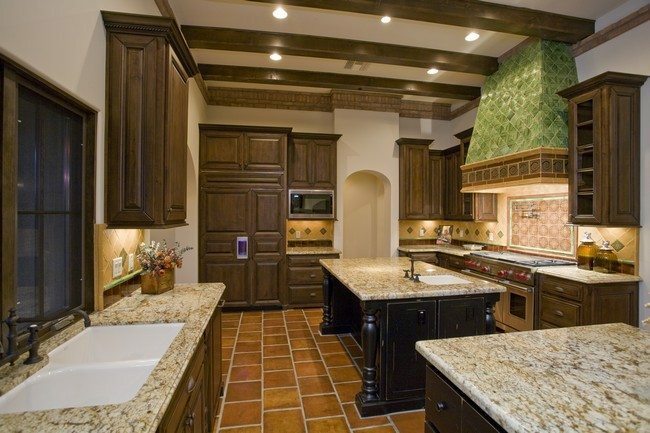 Have fun with your kitchen cabinets by creating unique kitchen cabinets made from two or more different materials. 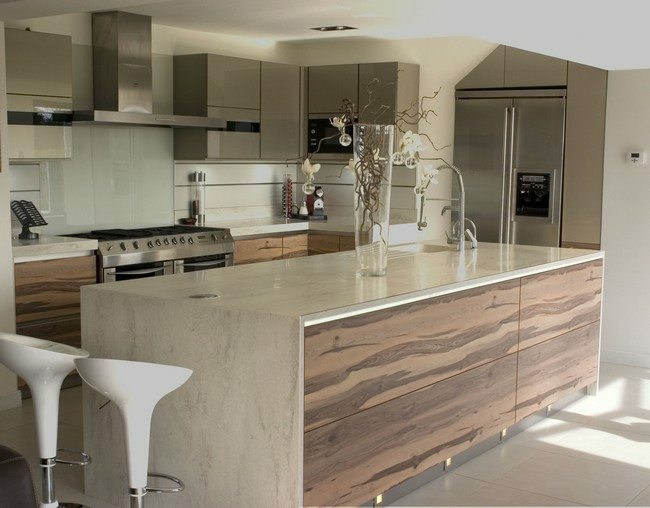 In this kitchen, the cabinets are made from stone and fitted with steel doors. 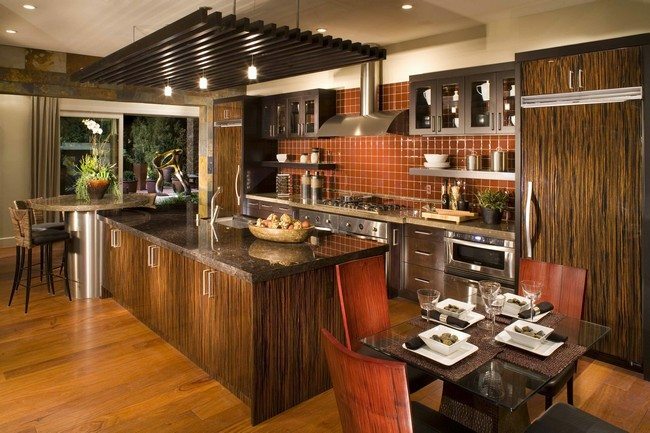 The cabinets in this kitchen look unique because they combine two major design elements; color contrast and combining cabinets with shelving. 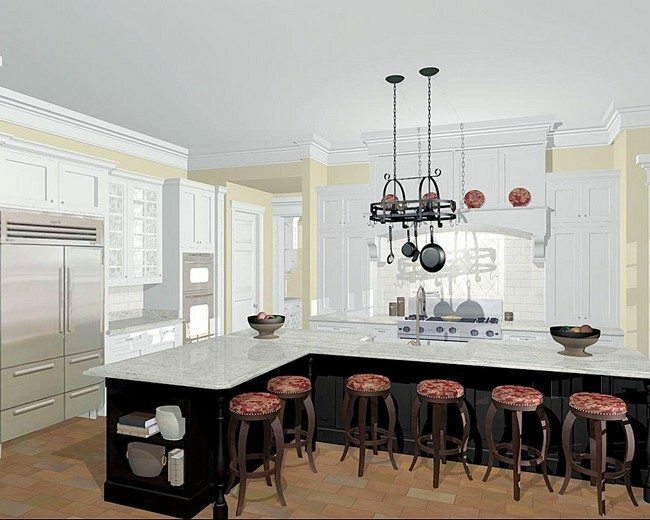 The white color of the cabinets contrasts perfectly with the blue color of the top, lighting up the room effortlessly. 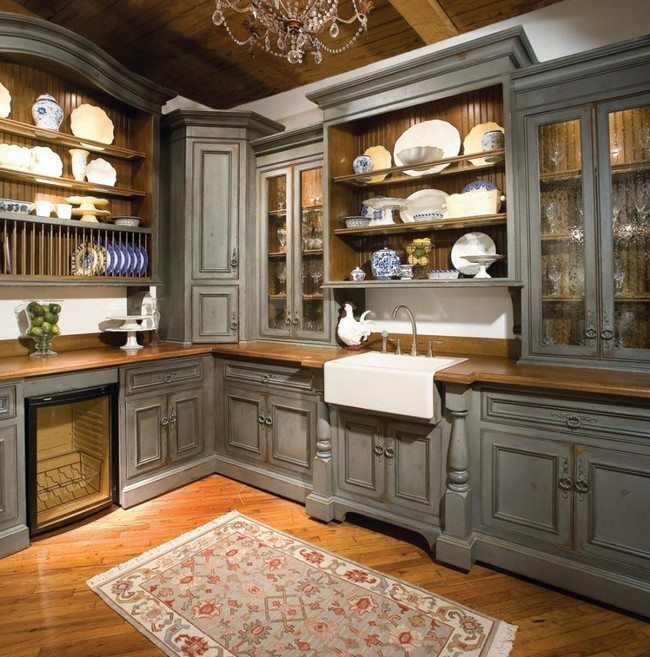 Also, the idea of having shelves at the bottom and drawers at the top makes this cabinet unique. 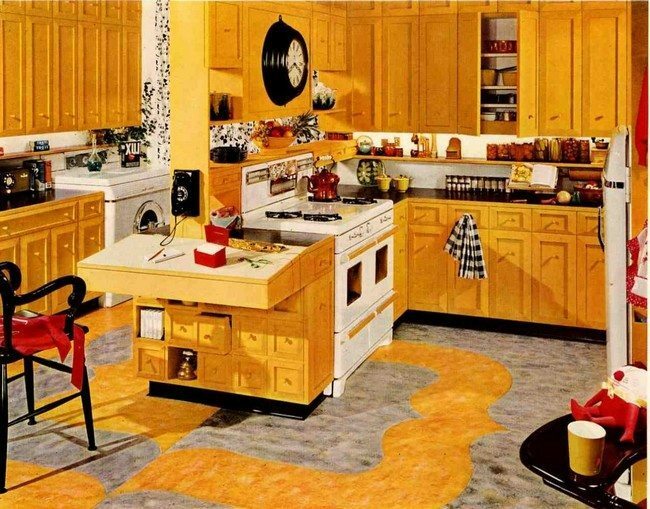 On one side of this kitchen is an ordinary kitchen cabinet and on the other side, there is a uniquely-shaped kitchen cabinet, with an island at the center. 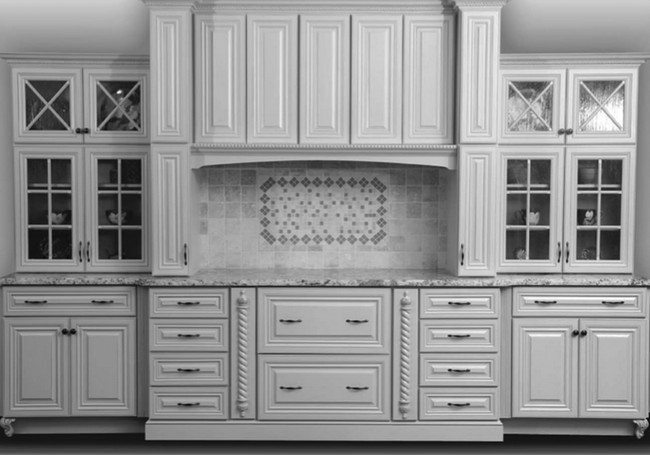 When it comes to designing cabinets in general, it always pas to think out of the box. 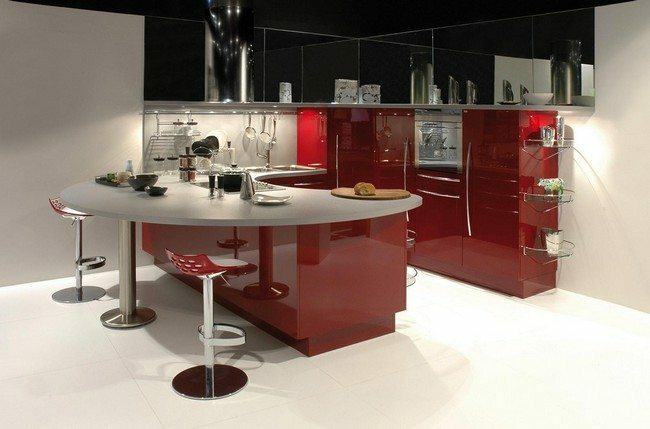 Do not think of the ordinary cabinet designs when you can quite as well come up with your own unique and interesting design. 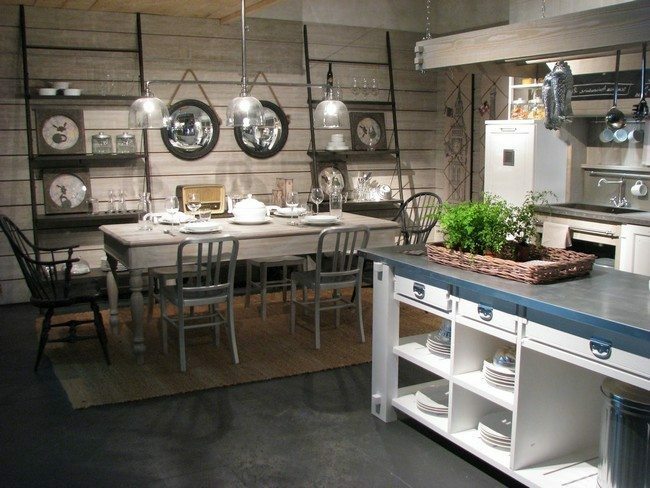 This unique cabinet features an arched structure above the lower cabinet, which acts as a shelf. 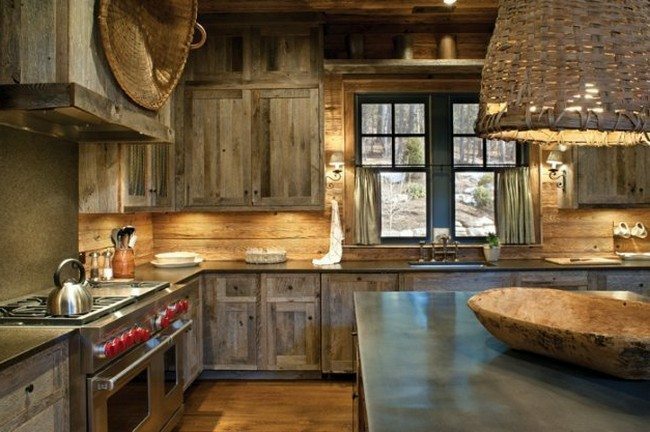 This kitchen is inspiring in so many ways. 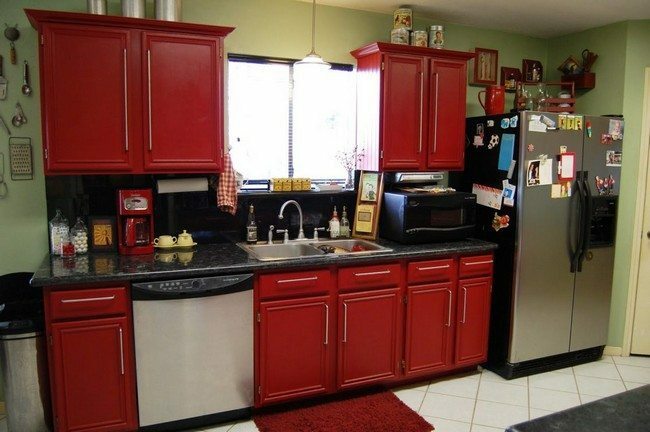 The cabinets are unique because of the lighting. 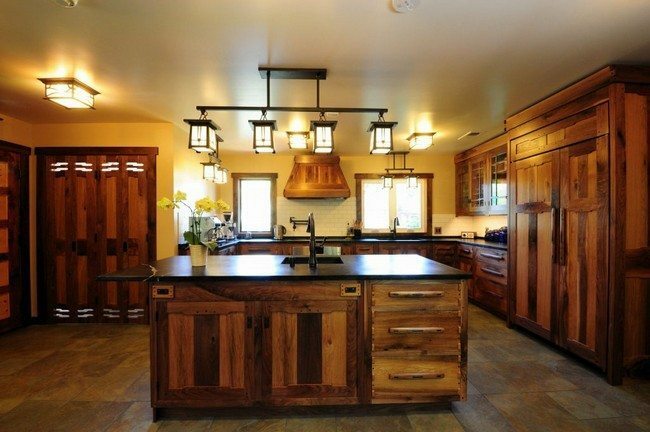 It is always a good idea to create kitchen cabinets with glass doors and create interior lighting, so that the cabinets light from the inside. 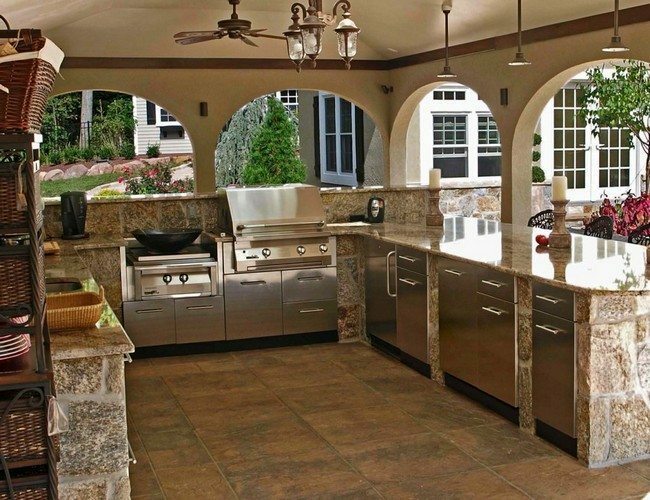 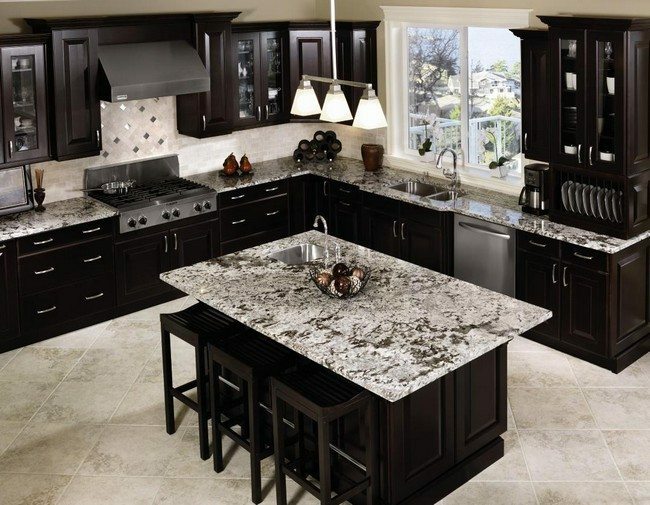 There’s no doubt that your kitchen will appear elegant, especially at night. 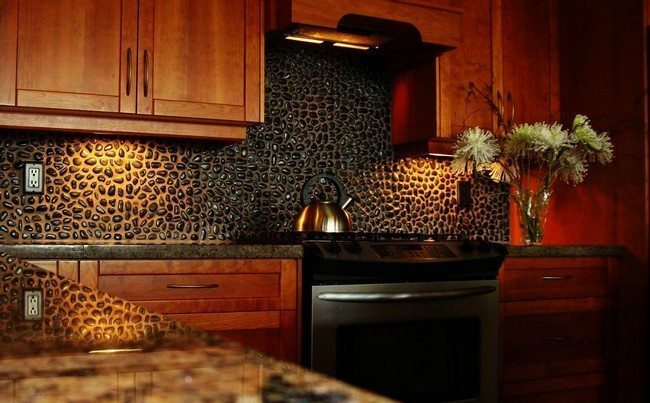 These unique kitchen cabinets make quite a statement. 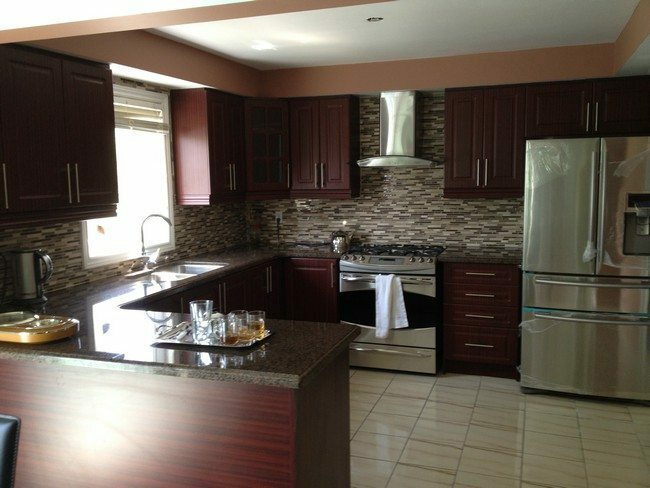 If you want to make a statement, then you can as well opt for cabinets without doors, or, if you prefer having doors on your cabinets, you can opt for cabinets with glass doors. 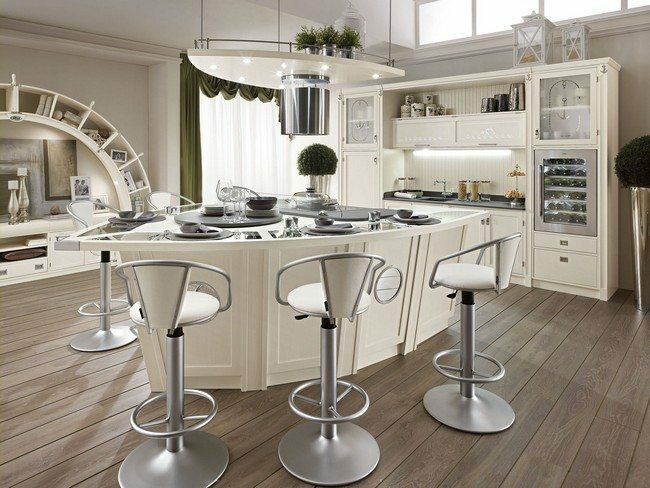 This way, the beautiful dishes, glassware, china and silverware in the cabinets can dazzle your kitchen with beauty and elegance. 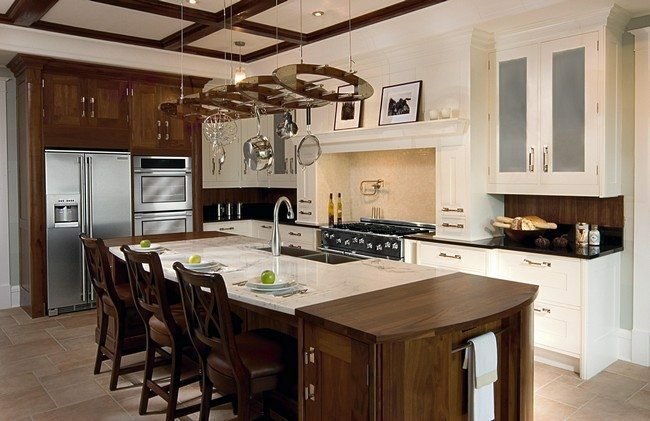 As you can see in this kitchen, the dishes, bowls and china steal the show, and make the kitchen appear even more elegant when combined with the view of the adjacent cabinets with frosted glass doors and the chandelier above. 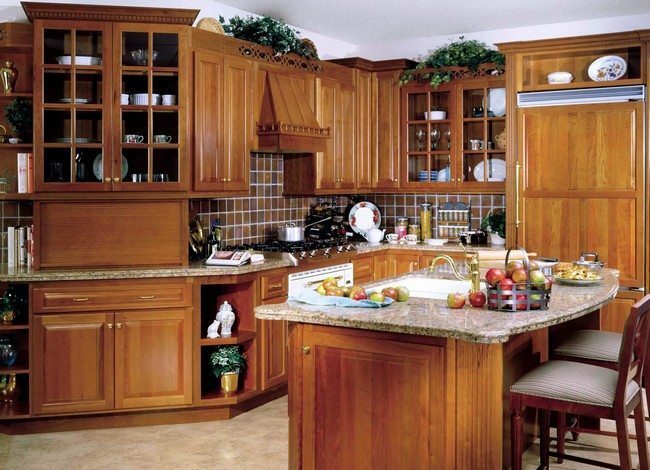 If you choose to have wooden cabinets, then you should first know that the tone of the wood is everything. 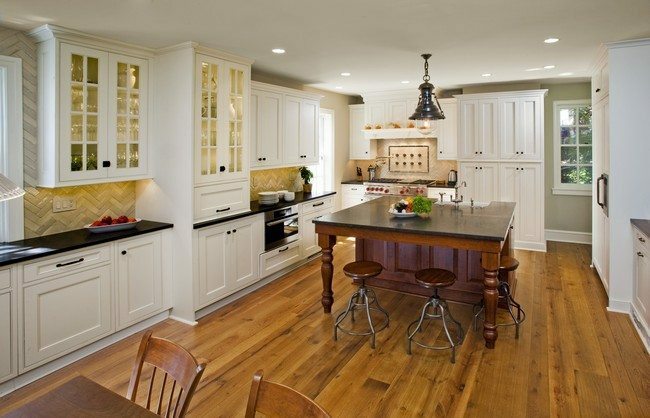 Here, the light tone of the wooden cabinets makes this kitchen appear bright and lovely. 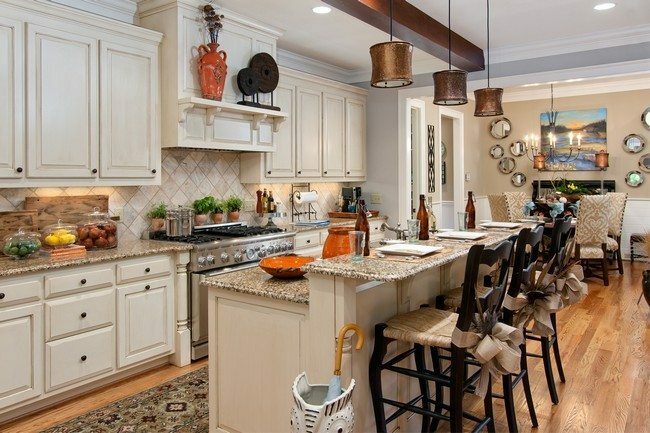 The items scattered all over the cabinets also add warmth to this kitchen.